Silicon Valley’s inequality is well documented. While the region’s technology sector is booming, many working people have been left behind. But there’s a growing movement to change that, spurred by labor unions and the Silicon Valley Rising coalition. 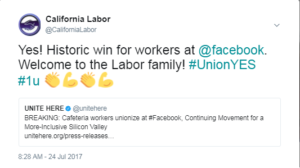 This week cafeteria workers at Facebook voted to stand together in a union, joining tech company shuttle bus drivers, janitors, security officers and others who have unionized in the last few years. 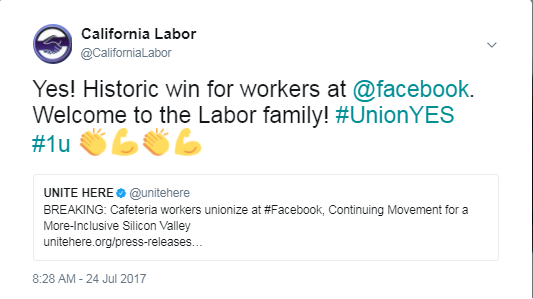 This week, over 500 food service workers at Facebook won union representation at the tech giant’s campus in Menlo Park, CA. The workers, who are employed by contractor Flagship Facility Services, are calling for increased wages to compete with skyrocketing rents and more affordable health benefits. There are approximately 5,000 food service workers in Silicon Valley—many of them immigrants and people of color—along with hundreds more in various tech hubs like Seattle, Austin, and New York City. Flagship cafeteria workers at Facebook are calling on the tech company to continue to be a leader in the industry in addressing inequality in the industry and the communities it impacts. Flagship workers will join cafeteria workers at Intel, Cisco Systems, Agilent and Nvidia, who are all currently members of UNITE HERE Local 19. More evidence that when working people stand together, we can accomplish great things for our families and communities. We look forward to seeing more tech company workers standing together in the future to ensure that those who help create the enormous wealth generated in Silicon Valley receive a living wage and decent benefits. Help spread the good news! Share on Facebook and retweet!